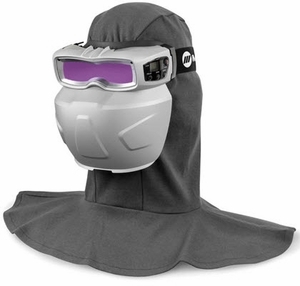 The Miller Weld-Mask™ 2 is a shade 5-13 auto-darkening welding goggle for the industrial welding market. The expanded face protector allows you to wear a Miller half mask respirator and safety glasses under the Weld-Mask 2. The larger flame retardant cotton head shroud provides greater head and shoulder coverage. The Weld-Mask 2 combines a larger rigid face protector and flame retardant head/shoulder shroud with shade 5-13 auto-darkening welding goggles with X-Mode™. X-Mode™ is ideal when welding with low amperage DC TIG, with obstructed views of the welding arc or while welding outdoors. Goggles are capable of DC TIG welding down to 5 amps, have external controls and come with a 2 year lens warranty. The Weld-Mask 2 is lightweight, comfortable safety solution for light duty MIG welding, TIG welding, plasma cutting and oxy/fuel cutting. It is ideal for working in tight spaces and can be worn under a hard hat without the use of any adapters. Ideal for industrial or construction environments. Can be worn with a Miller® Half Mask Respirator and Miller® Classic safety glasses. Shades 5-13 for use with MIG, TIG, stick, and gas welding and cutting. Wide singular lens provides unmatched auto-darkening range of visibility. X-Mode™ electromagnetically senses the weld to eliminate sunlight interference and continuously detects the arc even if sensors are blocked. Compact design allows users to weld in spaces where access with traditional welding helmets is limited darkness for precision welding. Face shield and flame retardant head cover provide coverage for UV/IR rays and applications with limited spatter. 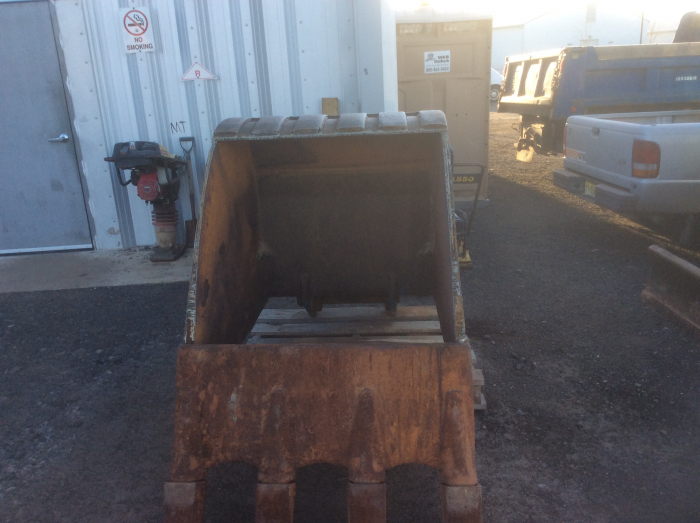 Ideal for use with hard hats - fits under a hard hat without the need of an adapter. Package of 5 - Genuine Miller® Weld-Mask™ 2 replacement front cover lens. For use with Miller Weld-Mask 2 auto-darkening goggles ONLY. Package of 1 - Genuine Miller® Weld-Mask™ 2 replacement anti-fog inside cover lens. For use with Miller Weld-Mask 2 auto-darkening goggles ONLY. Package Of 1 - Genuine Miller® Weld-Mask™ diopter 0.75 magnifying lens fits directly behind the lens assembly to give you a clearer view of your work. Package Of 1 - Genuine Miller® Weld-Mask™ 2 diopter 1.00 magnifying lens fits directly behind the lens assembly to give you a clearer view of your work. Package Of 1 - Genuine Miller® Weld-Mask™ 2 diopter 1.25 magnifying lens fits directly behind the lens assembly to give you a clearer view of your work. Package Of 1 - Genuine Miller® Weld-Mask™ 2 diopter 1.50 magnifying lens fits directly behind the lens assembly to give you a clearer view of your work. Package Of 1 - Genuine Miller® Weld-Mask™ 2 diopter 1.75 magnifying lens fits directly behind the lens assembly to give you a clearer view of your work. Package Of 1 - Genuine Miller® Weld-Mask™ 2 diopter 2.00 magnifying lens fits directly behind the lens assembly to give you a clearer view of your work. Package Of 1 - Genuine Miller® Weld-Mask™ diopter 2.25 magnifying lens fits directly behind the lens assembly to give you a clearer view of your work. Package Of 1 - Genuine Miller® Weld-Mask™ diopter 2.50 magnifying lens fits directly behind the lens assembly to give you a clearer view of your work. Genuine Miller® Weld-Mask™ 2 Light Accessory Kit mounts to top of the Weld-Mask 2 lens and provides a bright view of the work area while welding in dark places. Genuine Miller Weld-Mask™ 2 replacement flame resistant head cover. For use with Miller Weld-Mask 2 auto-darkening goggles. Package of 1 - Genuine Miller® Weld-Mask™ 2 replacement head band with adjustment buckle. For use with Miller Weld-Mask 2 auto-darkening goggles ONLY. Pkg of 1 -Genuine Miller® replacement CR2450 lithium battery for all Miller® auto-darkening welding helmets except Pro Hobby™ Series. Also fits Miller® Weld-Mask™ 2 welding lens. Miller Weld-Mask 2 Auto-Darkening Welding Goggles 280982 is ideal for industrial or construction environments. Will this work for someone who wears glasses. If not do you have one that can be. Miller Weld-Mask 2 Auto-Darkening Welding Goggles 280982 will work with standard reading and safety glasses. What is light shade, while not welding? Miller Weld-Mask 2 Auto-Darkening Welding Goggles 280982 is in light shade 3 while on and not welding. What is the advantage to getting a Weld Mask 2 versus the Weld Mask? Miller Weld-Mask 2 Auto-Darkening Welding Goggles 280982 has an expanded face protector allows you to wear a Miller half mask respirator and safety glasses under the Weld-Mask 2. The larger flame retardant cotton head shroud provides greater head and shoulder coverage. It also features X-Mode which electromagnetically senses the weld to eliminate sunlight interference and continuously detects the arc even if sensors are blocked. Is the face shield removable? Miller Weld-Mask 2 Auto-Darkening Welding Goggles 280982 comes wit the head cover. I bought one thinking that it would work to their claim that it was designed with shipyards in mind. Working in tight spaces and poorly lit. Well first mask I got, straight out of the box worked for a little bit, I was welding in the shop and it started flickering so I turned it to X-mode thinking its too bright. Nope still flickered and would constantly flicker so I got a warranty replacement less than 14 days after purchase. Not even 5 minutes of opening that new weld mask it was flickering just taking off the lens flims that come on new shields. It wasn't even on a medium or high sensitivity. I tried a brand new miller brand battery for that mask, same thing. I wanted to give this mask every chance because its a great design but 2 masks back to back not working hurts productivity. Its not like I'm inexperienced, I do nuke work on submarines and have used all kinds of auto shields and lenses. Conspoorly executed, flickering lens, Rubber goggle hurts ridge of nose. The Weld Mask 2 is a definite improvement over the original Miller Weld Mask. The addition of the sensitivity and delay was a much needed, giving you the ability to adjust for you environment. I am a professional and prefer glasses over cheaters, and the mask fits over them without any issues. My only issue with this product is the lack of air movement in the viewing area creating a fogging issue. I have resolved this issue with my other helmets with a small nylon tube attached to a regulator with compressed air. Bought this for confined spaces. Its great. Respirator and safety glasses do fit while wearing the mask. The inner lens does not fog and the mask is comfortable to wear. The hood sock covers your entire face so you dont get burns while welding. I would wash it before wearing. Upon opening the hood sock smelled of strong chemicals. I would highly recommend investing in this weld mask.